StageofLife.com witnesses substantial social media growth after the launch of its new writing resource - a national writing contest using Twitter. StageofLife.com, an educational and writing resource for high school teachers, students, and bloggers rolled out a new monthly writing contest using Twitter. 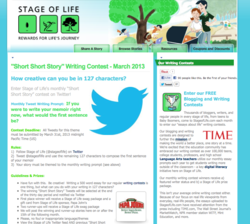 Interested contest participants simply need to visit the Stage of Life's "Short Short Story" Twitter Writing Contest page to view the contest rules and then Tweet their 127 character (or less) submission to @stageoflife to enter. Since 2009, Stage of Life has seen thousands of writers, bloggers, and students participate in its grassroots, education-focused writing and blogging contests with essays and blog posts. The new Twitter contest is an evolution from the blogging and digital literacy initiative that the site has been focused on for the last few years...and it's working. Since the launch of its writing contest on Twitter in February 2013, StageofLife.com has experienced a 238% growth in Twitter followers over the last two months from the previous two month period. StageofLife.com also hosts a variety of writing resources for high school Language Art teachers, college professors, home schooling parents, and students. For more details or to entry the StageofLife.com “Short Short Story” contest on Twitter, visit http://www.stageoflife.com/Writing_Contests/TwitterWritingContest.aspx for instructions and this month's writing prompt. 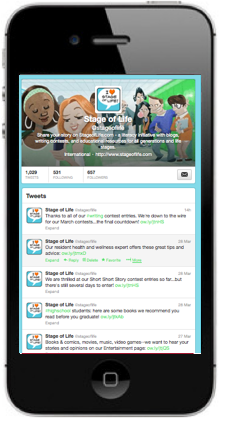 Stage of Life selects one winner, two runner's up, and several finalists each month from all of the Tweeted submissions. The winning “Short Short Story” Tweet owner receives a prize package from Stage of Life that includes a gift card from Stage of Life literacy and education sponsor, Papa John's. StageofLife.com is a privately held company with a literacy mission to encourage life-long readers and writers through its blogging community designed for all generations, from teens to Baby Boomers. Since 2009, StageofLife.com has welcomed over half a million bloggers, writers, and readers from over 100 countries who have come to read or share stories. The site was founded with a grassroots mission to make the world a better place by becoming a writing and blogging resource for all generations. It hosts over 5 million words from thousands contributing writers and has grown into one of the largest multi-generational online communities on the web. 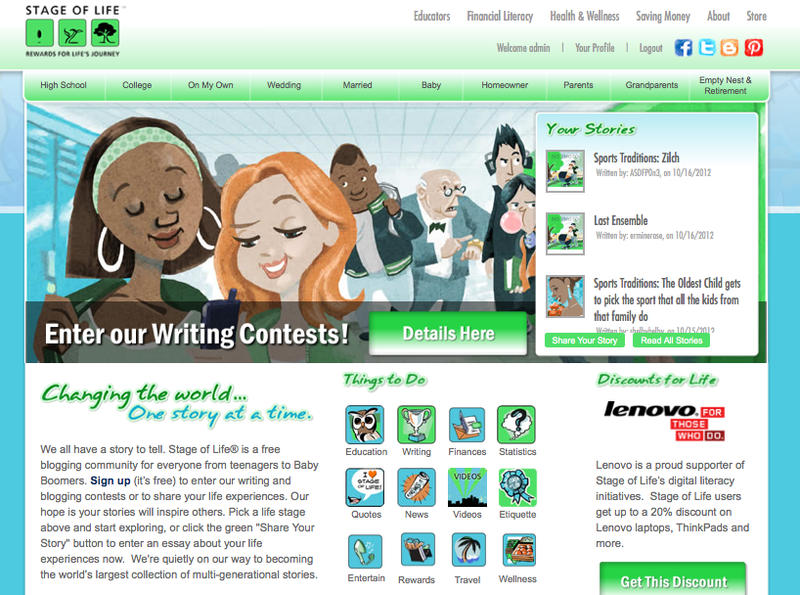 The site features free educational resources ranging from writing contests, blog resources, Language Arts lesson plans about blogging, goal setting worksheets, writing prompts, coupons for teachers and students, and more.